Review: A jewel thief is suspected of returning to his former occupation. He pleads innocent and goes in search for the true thief. This is not Alfred Hitchcock’s best film but it is still excellent and worth a watch if you haven’t seen it. This film is a classic. Alfred Hitchcock was Cary Grant’s favorite actor to work with. They worked together on a lot of films. 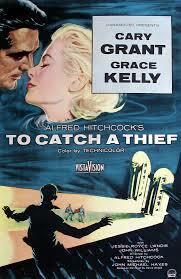 Cary Grant and Grace Kelly both acted really well in this. This film has been re-released quite a few times once in 1991 and again in 2003. On the 14th September 1982, Grace Kelly was killed in an automobile accident in Monaco. She was 52 years old and lost control of her car while suffering from a stroke at the wheel. Before staring in this film Cary Grant announced that he was retiring. After this film he continued acting for another 11 years. It is believed that cuts have been made to this film. At the Academy Awards in 1956 it won one Oscar and that was for Best Cinematography,color. One film critic wrote “Lavishly shot in the French Riviera, this romantic thriller is vastly entertaining due to star power of Cary Grant and Grace Kelly”.